Don’t have access to a high-priced, private-land honeyhole? Here are some proven strategies from some of the Midwest’s finest public-land whitetailers. The beam of the tiny flashlight cut the pitch-black, fog-shrouded predawn as deftly as Darth Vader’s light saber, but it didn’t find what I’d been searching for—the sparse bits of fluorescent orange surveyor’s tape that marked the winding trail to my deep-woods treestand site. It’s been over a decade now since that fated morning, when, carrying my climbing treestand on my back, I finally settled for a tree that seemed "close enough," and began to set up. Just a few minutes past first light I knew I’d—somehow—guessed correctly. The wide-racked eight-pointer approached steadily from my backside, angling predictably toward the large bedding area that I faced. It was pure luck that I’d set up on the buck’s trail, but I had some of the other kind of luck working too. In the darkness, I hadn’t tucked my bow-tow rope quite far enough into the large cargo pants pocket. Unbeknownst to me the rope had managed to fall out. As I heard the buck come to a halt behind me and freeze, after two or three anxious minutes I just had to find out why. Sure enough, peering around the tree I glimpsed the buck, eyes glued to the strange, dangling rope just a few feet ahead of him. It didn’t help that craning my neck backward made the rope sway and dance. A few more seconds, and he bolted. I looked down, and simultaneously saw the rope, and buck’s trail that led under the tree. My tree. I darn near cried. I learned a few lessons that morning, but one of them was public land deer hunting can be productive if you know your area well. A friend and I had stumbled onto that bedding area the previous day. We’d been searching for just such a location—the security cover of deer that were feeding in one of the few fields in the area, drawing them like a magnet, almost a quarter mile off on private land. But the bedding area and surrounding woods was owned by an area paper mill, land that in Wisconsin is open to public hunting via a tax-break agreement with the state. The large, wilderness tract is similar to many county and National Forests located in northern Wisconsin, and similar to scads of others located in Michigan's Upper Peninsula, in Minnesota's Superior National Forest, as well as in the sprawling Shawnee National Forest in southern Illinois. Bowhunting them can be a bonanza of unpressured opportunity, but you’ve got to do it right to score. 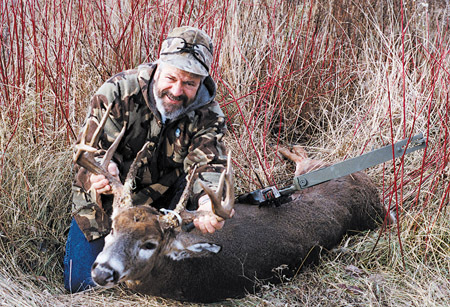 Bill Schutte is a northwoods Wisconsin resident who has held office in the 10,000-strong Wisconsin Bowhunter’s Association, one of the largest such organizations nationwide. 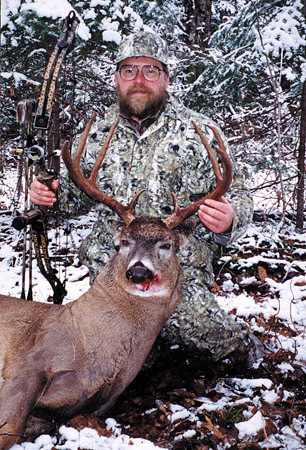 He’s also bow-bagged more than 20 mature Wisconsin bucks, several of which have dressed out more than 200 pounds. Nearly all of them have come from public lands. "I'd say, better than 80 percent of my bowhunting is done on public land," he said. "Basically, you’ve got more access. Up here in northern Wisconsin, we’ve got a lot of public land, between the Chequamegon National Forest, and county and forest croplands. With so much property to cover, Schutte weeds out much of it quickly. "I look more at areas that are more inaccessible, which people to tend to stay away from—a lot of swampy terrain, a lot of brush, where habitat is great and yet a lot of people overlook. "Being from this area, I do a lot of walking in the woods. As a kid my father was a trapper for a living, and he spent most days out in the woods. When we grew up, we didn’t use snowmobiles. We simply did all of our scouting on foot. If we wanted to look for beaver in a stream, we’d walk it for five miles, from one road to the next. I do use topo maps, but there’s nothing like getting out there and checking it out. Up here, we have so much woods, you almost have to get out and look an area over. There are certain ridges, hogbacks, and beaver dams—big beaver flowages that stretch for half a 40 or better, and deer will skirt the edges of those—they can be real hotspots. "A very valuable piece of information is a county plat book. They have all the public lands marked. I probably do most of my hunting on county forest cropland. There is a lot of open, public areas that people just don’t know about." Generally, Schutte finds the hunting pressure light, and deer populations thriving. "Sometimes I’ll have a few guys in the area, but by most people’s standards, it’s very low pressure. Up until about nine or 10 years ago, I did all my hunting in the Chequamegon National Forest, and if I saw another human track in the section (one square mile) I was hunting, I’d go somewhere else." This type of hunting doesn’t come easy; Schutte regularly puts his time in scouting the huge blocks of terrain. Prime time is early spring, just after the snow melts. "I look for a lot of deer sign in general, but in the springtime, you can still see the scrapes from last fall. And of course, buck rubs are clearly visible. Certain areas that harbor big bucks, they use a lot of these areas from year to year. If you can see evidence of buck sign for several years, there’s a good chance the area will be hot again." For Schutte, an ATV is a big help in getting far enough back into the woods quickly, using logging trails and other two-tracks that typically can’t hold a full-size vehicle. But he makes sure to minimize engine noise as much as possible. "It depends on when I’m going to hunt, if it’s an evening hunt, it’s not as crucial. Then, I’ll park maybe a quarter of a mile from my stand. But I do a lot of early morning stand hunting, and I like to get to my stand about an hour before daylight. I don’t know if it’s necessary, but everything will settle right down. I don’t like to run an ATV within a half mile of a morning stand." Schutte, who has developed an uncanny memory since his days as a trapper, never marks his treestand entrance trails, preferring to hike to them—even in darkness—using just his own inner compass. For those of us not quite as gifted, a small flashlight—with backup—and handful of Bright Eyes or similar trail markers can be indispensable for quick and easy access. 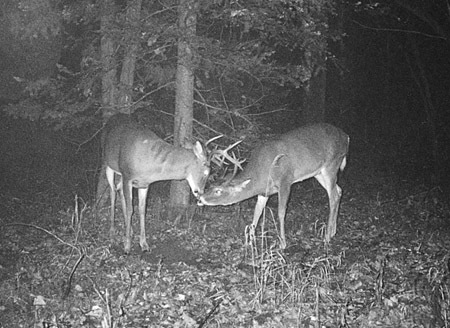 Like many whitetailers, Schutte’s "hot time" to be in the woods is the last two weeks of Wisconsin’s early bow season, which has typically ended about Nov. 10 or 11, and lately, in mid-November. So, he’s hunting hardest during the peak rut. To cash in on unpredictable bucks at this time without alerting them to his presence, Schutte jumps from stand site to stand site. "I never hunt the same stand for more than a full day—typically, I’ll hunt a stand for an afternoon, then hunt it the next morning, and then I won’t go back for three or four days. But, lots of deer activity can cause me to make an exception. The trick, I believe, is to not turn the deer nocturnal, and hunting pressure will do that. For a nine-day hunt, I like to have at least four good stands ready." Schutte’s "no pressure" plan also includes avoiding spooking does. His best stands are always near doe concentrations that seem to be particularly active during daylight hours, and he wants to keep them that way. "The more active those does are, the better chance they have of attracting bucks during the rut." Schutte searches for specific areas in the large wilderness tracts. "I like getting on little ridges that I find in low swampy areas—a ridge that’s in-between swamps—no matter how thick it is. The deer like to work those little ridges, near the alder swamps, anywhere they can cross without getting their feet wet. A lot of the ridges will be just a little high spot, maybe 200 feet long by 60 feet wide. The farther off the beaten path, the better." Schutte’s gear is basic, but effective. So is his scent-reducing regimen, which he follows religiously. "I wear all wool. The jacket is camo, the pants are just a dull drab color. I think camo is very good, but any dull color is also very good. I think the absolute biggest thing is being clean. I don’t put my clothing on until I get in the woods. I keep it in a barrel or bag, with spruce, balsam, or cedar limbs so they absorb the scent." Schutte also makes liberal use of Robinson Outdoors’ Scent Shield spray, and showers frequently with unscented soap. "When I have the whole day to hunt, I take two or even three showers in one day. I’ll shower in the morning, and if I come back in at 11 a.m. I’ll take another. It’s a critical thing a lot of people skip." To further cut scent dispersal Schutte also wears rubber-bottom pack boots. By his own admission, Schutte, who also does some early fall bear hunting, owns "a lot" of treestands, all of them hang-ons, for noise-free installation. He likes to hang them in spruce trees because of all the cover they provide. Schutte’s biggest buck, a thick-racked heavyweight that grossed 141 Pope and Young points, was sighted three times before he finally killed it with his bow, during Wisconsin’s late bow season. But that highly visible deer was an exception. "Most of the bigger bucks I’ve shot, it’s been the first time that I’ve seen them. Schutte says rattling can sometimes work to draw traveling, rutting bucks to his stand, but he’s never without his grunt call. “One thing I’ve noticed, I’ve yet to spook one by grunting. You may not get any reaction from them, but it doesn’t seem to bother them at all.” Schutte stresses that hunters who hunt the northwoods should come prepared. "Wear warm clothes, bring a compass, and know which way the roads run, so you can always get out if you need to. It’s really not that remote, but there are spots where you have blocks of timber four to five miles wide, without any real roads." "I like to hunt the oak ridges, I like to hunt the oaks more than anything," says Roger Hansen, another public land bowhunting guru from northern Wisconsin. Like Schutte, Hansen concentrates on deep-woods stand sites ferreted out by intensive scouting, located primarily along proven rub lines and scrape lines. He prefers hunting during the pre and peak rut, when buck activity in these areas is high. "My stands will probably average a mile into the woods; I try and get back a little farther than most people. I like to find a bottleneck, a travel corridor where bucks are traveling from one doe family area to another, and they seem to do most of that traveling in the morning.” Hansen said that experience has shown, especially during the rut, that he will see most buck activity between 9 and 10 a.m. “I’m not exactly sure where they are in the afternoon, but the morning seems to be pretty consistent." Also like Schutte, Hansen follows a strict scent-free regimen that includes a Robinson Outdoors ScentBlocker suit, and knee-high rubber boots such as those made by LaCrosse and Rocky. But, Hansen prefers climbing treestands. "I like a climber because I can bring it in and out with me quickly and easily, and I don’t have to worry about moving it if I have to." "I always carry one or two grunt tubes, and use them frequently. I’ve also rattled a few bucks in, but I find that most are just 1 1/2- to 2-year-olds—the bigger bucks don’t seem to investigate the rattling as much." To maximize his scouting, Hansen has also begun playing with the newer game cam scouting units that have shown him some amazing sights—some he didn’t even know existed. The cameras show great promise for future use, he says. The key is setting the cameras up on buck sign—scrapes and rubs—both of which will equate into many more buck photos than does. "Basically, you find there’s a lot more bucks out there than you realize in your hunting area." One year, for example, Hansen saw six different bucks in one of his hunting areas, and captured eight more different bucks on film there. Hunting hard all fall, he saw only one of the bucks captured on film. Speaking of hunting hard—and smart—Hansen gives most of his better areas a rest until the last week in October. Until then, he’ll know the deer haven’t been disturbed and so should be prime for the picking. Hansen’s best tips for public land hunters, however, are some familiar ones. "The biggest thing is that people just aren’t careful enough about their scent, the type of boots they wear. At the least, a person needs to wear good rubber or rubber-bottom boots. "The other thing is, people aren’t cautious enough about the approach to their stands. You’ve got to find an approach, so you’re not traveling through an area the deer are going to be using. That’s one thing I’ve been a lot more careful about, and it really seems to help."